How can we make the experience of filing bankruptcy better? Over three weeks my team was challenged to improve the user portal for UpRight Law clients. UpRight Law is the premier client of Bridge Legal, a software provider for law firms specializing in bankruptcy filings. Read on to see how we created a mobile-first web portal that helped users feel in control through the bankruptcy process. UpRight Law is a legal service that assists people filing for bankruptcy. They provide clients a payment plan, usually lasting 3 months, for the filing fee and a call center for legal questions. UpRight Law is a premier client of Bridge Legal, a software company specializing in payment processing, CRM tools, and client portals for law firms. 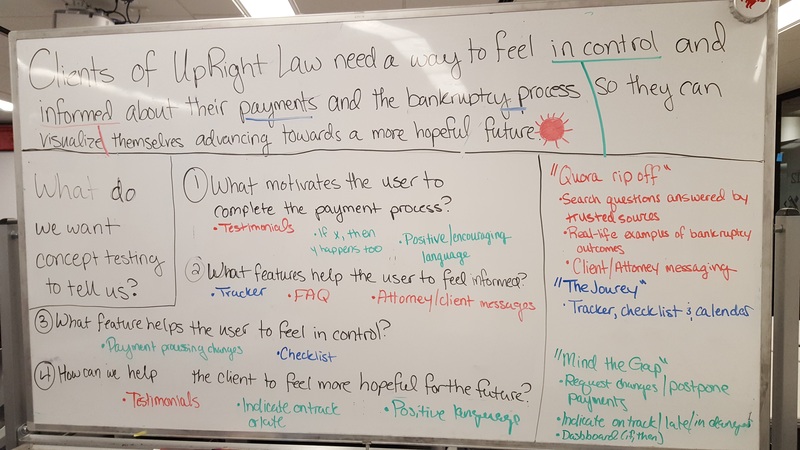 From our initial meeting with the client, we were asked to evaluate the usefulness of the current features and research features to improve UpRight Law’s KPIs. This included reduced cancellations rates, increased collection of funds, and reduced labor costs. UpRight Law stakeholders also expressed it was important that the portal help reduce call volume. 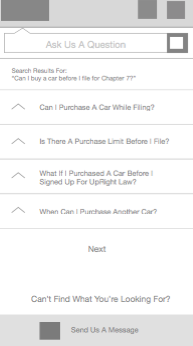 To understand users’ experience with UpRight Law’s current client portal. To understand the industry, specifically how the client portal could add value while simultaneously helping UpRight Law stand out from competitors. We then decided on which methodologies to use to achieve these goals. We chose to complete a competitor analysis, user interviews, and stakeholder interviews. Our biggest takeaway from completing this analysis was understanding that there are no true direct competitors with UpRight Law. Also, since we didn't have a login for any legal client portals, we had to look to other industries to see how portal designs were successful. We looked at a health company because they were able to make complicated information simple. We also looked at the Domino's pizza tracker because it is a chain available in rural areas that our users might be familiar with. During our kick off meeting with the client told us their users are primarily rural, have a low household income, and access the internet primarily through mobile. We didn’t want to operate under any assumptions and tested this information during our interviews. We interviewed 7 bankruptcy filers and 3 stakeholders. Our interviews validated many of our client's assumptions. They had a very good understanding of who the user is and, for that reason, we chose not to make a formalized persona. We created a proto-persona to outline our user's behaviors, goals, and frustrations so we could reference this throughout the design process. From our interviews we had five main insights that drove our understanding of the problem users faced. These insights were also supported by the call data I requested from UpRight Law. Since the client wanted the portal to reduce the number of phone calls, I asked them to pull a day's worth of data to understand the main reasons people were calling in. Users are meticulous about their bank account balances and the timing of their payments. Users often only have enough money in their accounts a couple hours before their payment is withdrawn. From pulling the call records at UpRight, we knew that 42.5% of calls were payment related. The most common call reasons were to cancel or reschedule payments. Bankruptcy is usually associated with another negative life event. From speaking with our users we learned they were often facing other life crisis that either lead to or were a result of their bankruptcy. Clients sacrifice wants and even necessities for the payment process. We heard many users say they put off the filing because they couldn't afford the payments needed to retain a lawyer. The average UpRight Law client had an average household income of $29,200. Clients actively seek bankruptcy information & seek affirmation from a trusted person. This helps them to feel safe and comfortable going through bankruptcy. Often times clients don't tell friends or even close family members they are going through bankruptcy, so it is important that they can trust and rely on the service provided by UpRight. 57.5% of calls to UpRight were questions about the bankruptcy process. Understanding how to deal with creditors is a priority for the client. 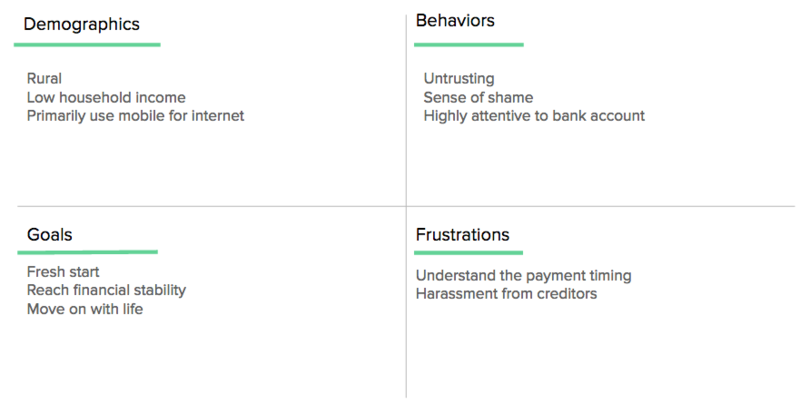 We heard from users that they face constant harassment from creditors and it is one of the main motivating factors for filing bankruptcy in the first place. Of course, we already had the assumption that going through bankruptcy was a very difficult process but we heard many heart-wrenching stories during our interviews. It confirmed that bankruptcy filers face a number of challenges as they take an important step in creating a better future. We built a lot of empathy for our users and were inspired to create something that made their lives a little easier. Before becoming clients with UpRight Law, bankruptcy filers face social stigmas, creditor harassment and constant fear of losing their assets, leaving them anxious and unsure about their future. Once individuals become UpRight Law clients, they go through an initial pre-filing payment period, during which there are few touch points between UpRight Law and the new client, unless they call in. Clients of UpRight Law need a way to feel in control and informed about their payments and the bankruptcy process so they can visualize themselves advancing towards a more hopeful future. We knew that as we ideated solutions to the problem, we would need guidelines to create the best experience possible for the user. As a result, we created the following design principles. First and foremost, the design should help users stay positive and feel they are making progress towards a brighter future. Develop a sense of responsibility and loyalty between the client and UpRight Law throughout the bankruptcy process. Sometimes users will have many questions. Other times they will need a general understanding of where they are in the payment process. Users need the ability to zoom in or out, depending. As we ideated and tested, these design principles helped us drop features that fell outside of these guidelines. We approached the problem by sketching and brainstorming numerous ideas to address the problem. We broke down the problem statement and listed out how features addressed each component. Through a white-boarding exercise we were able to break down the problem and ideate possible solutions. 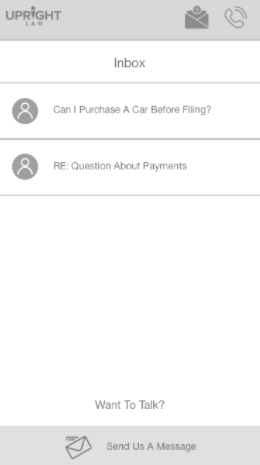 There were three questions at the core of the problem and our client asked us to also explore how to motivate users to complete the payment process. By focusing on this we would also help them decrease their cancellation rates. How could we help users feel in control? How could we help users to feel informed? How could users feel more hopeful towards the future? 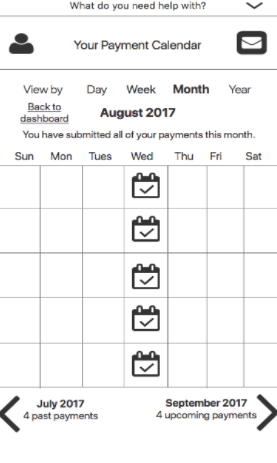 How could we motivate users to complete the payment process? We brainstormed multiple answers to each questions which led us to defining three concepts. I worked on this concept. 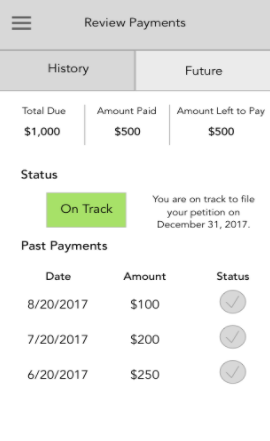 It allowed users to request changes to payments, understand how these changes impact their filing status and have an overall indication of the progress they’ve made towards being paid in full. Does this motivate the user to complete the payment process? Does this help the user to feel more hopeful for the future? Steve worked on this concept. Through this concept, users could access trustworthy, authentic resources quickly. 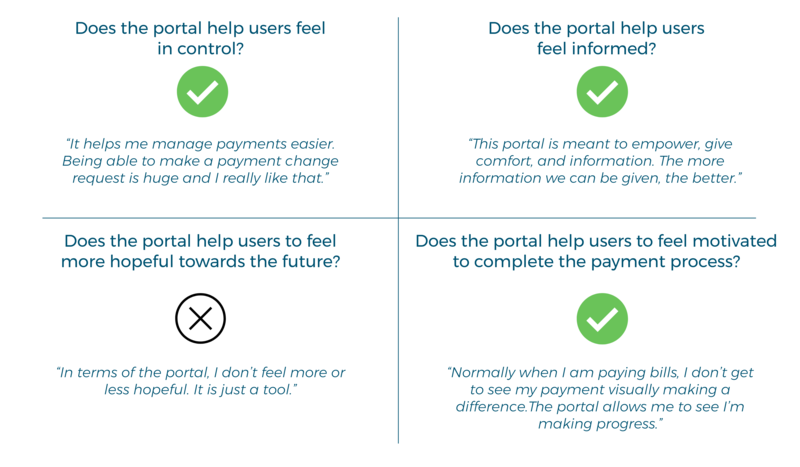 The portal’s ability to connect users to resources and answer questions quickly was vital for users to feel informed and hopeful for their future. user to feel in control? Does this help the client to feel more hopeful towards the future? Andrea worked on this concept. The idea was for users to keep track of their progress and understand each part of the bankruptcy process. 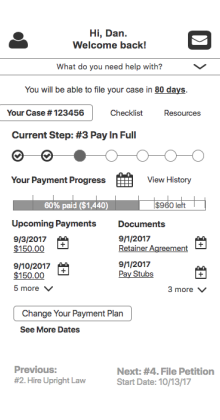 The user could go through the bankruptcy process step-by-step with a payment tracker and calendar to keep track of their progress. Does this help the user to feel more hopeful towards the future? We tested these concepts with five UpRight Law clients and one non-UpRight Law bankruptcy filer. From these tests we gained a clear sense of what worked. We referred back to our breakdown of the problem statement to see how our concepts performed. “I like knowing where I am with my payments at all times." Users liked the additional detail and thoroughness of the notification. A couple of users, however, felt strongly against it calling it ‘terrifying’ and ‘stressful’. Users liked that the important notifications stood out in red and were easily identifiable. 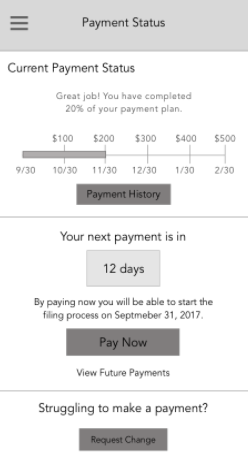 However, some users felt the red was too reminiscent of the late payment notifications they'd often seen. 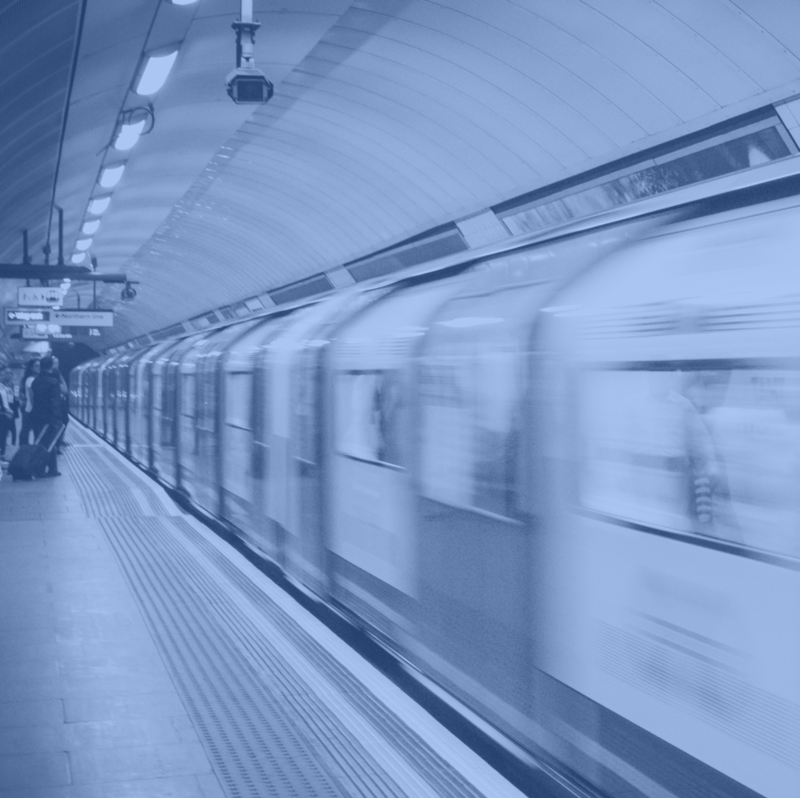 All users preferred getting messages through email rather than in the portal but they did not feel like its presence negatively impacted the experience. A couple of UpRight Law clients remarked that the testimonials felt too gimmicky or promotional. None of the users we tested noticed the testimonials without guidance. Most UpRight Law clients reported that they preferred to use their own calendar from Google instead of a calendar within the portal. Based on our testing, we kept the features that worked well for users, iterated on the features people were split on and eliminated what didn't work. When we built our final prototype we decided to layout the interface in card format. This allowed for easy thumb navigation, kept information well-organized, and was easily responsive. We also decided to go with a top navigation because that would convert well between mobile and web. 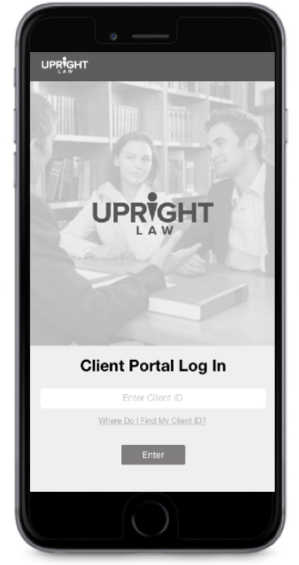 Click to navigate through UpRight Law's client portal. After creating the final prototype we went through one last round of usability testing. Users were asked to navigate through four tasks when we did a final round of usability testing. This testing allowed us to further iterate on any issues that occurred when converging our three concepts. Below are the main takeaways we had. Task flows were easy and intuitive. All of our testers successfully completed all four tasks without difficulty. We also heard users comment on how easy-to-understand the language was, which improved the experience. Users needed to know the timing of changes requests earlier. We included language at the end of the payment change request process letting the user know the change would be processed within 3-5 days. That needed to be moved earlier in the process because it might change whether or not the users decides to make the request. 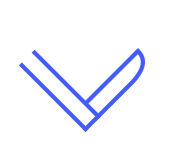 Overall, we were very pleased to hear that users reportedthe prototype helped them to feel in control, informed, and capable of making it through the payment process. Though, we heard from users they didn't really feel a client portal could help them to feel more hopeful towards the future. I really enjoyed working on this project and learning more about the bankruptcy experience. If I had more time to work on this portal, this is what I would recommend. Talk to more users and explore more of their needs, preferences, pain points, and motivations in order to make the existing wireframes more cohesive and reflective of Bridge Legal values. If it becomes feasible, live chat with clients would be worth researching further. Based on our research, several clients preferred email or messaging right away and appreciate the immediacy considering the anxious emotions that paying for bankruptcy filing induces. Many of the users that we spoke to prefer email notifications over in-app notifications or both, so I recommend having that option in account settings as an additional incentive users can depend on throughout the bankruptcy process. By implementing these future recommendations, Bridge Legal would ensure they are building out tools that are beneficial for their other clients outside of UpRight Law. This was the first UX project I worked on with a client. While this project was a lot of fun, it was not without challenges. These became unique learning opportunities that helped to shape my design skills. Find balance between the user needs and the business capabilities. Coming from a business and project management background, I found myself constantly worrying about the business constraints but I had to set that aside and focus on how to really improve the experience for the users. That was challenging for me but through this project I was able to better understand how to balance user preferences and business needs. Always refer back to the problem statement. 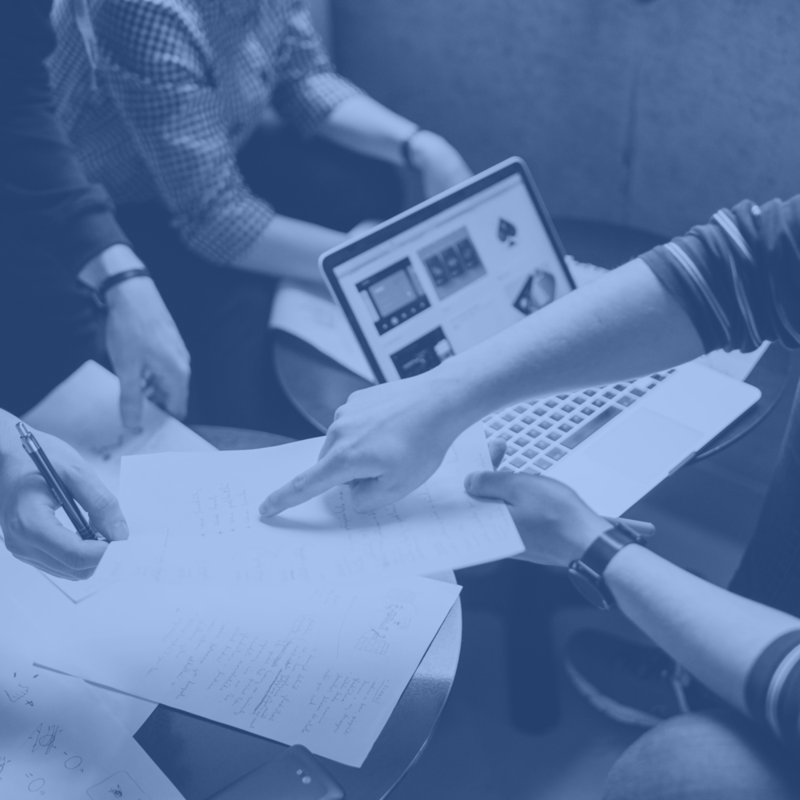 Through concepting, testing, and converging we always referred to our problem statement and the four questions we identified to make sure we stayed on track. This was really helpful and something I carried forward in future projects.